Your Creative Sauce were approached by Travel Tripper, a full-service hotel web technology provider and strategic partner in helping hotels worldwide to optimize conversions, expand reach, and generate demand. Working with their global digital advertising division we were asked to help out with web banner creation for their prestigious US clients. Travel Tripper required an high-end affordable studio that could turn web banner projects around quicker and faster than the US studios their clients were currently using. After initial consultation, we were asked to put together some design visuals for National Geographic's Unique Lodges and Private Expedition divisions. Excited at working on the NatGeo brand we worked with Travel Tripper to ascertain a project plan and lead time to ensure both them and their client were happy before proceeding. We started by collecting together NatGeo brand elements and brand guides to ensure brand consistency as well as library of all of their beautiful photography. Once collated we started to draft some design ideas together for NatGeo and Travel Tripper to discuss and approve. 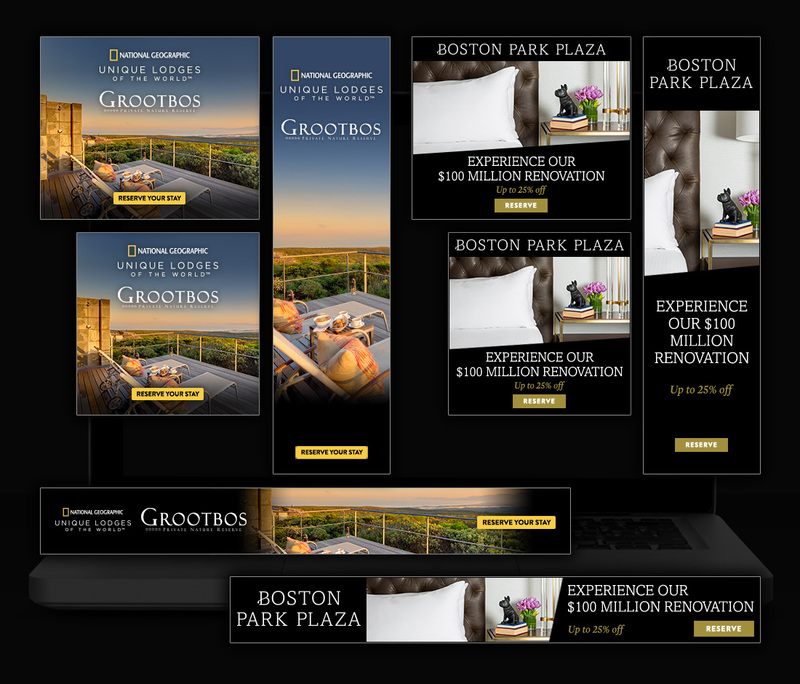 After client amends to the final template we created a suite of web banners for each hotel including different sizes and orientations so Travel Tripper had the maximum amount of choice when publishing NatGeo's digital advertising online. From concept through production to delivery both design ideas and the final web banner suites were provided by Your Creative Sauce in a fraction of the time it had been taking NatGeo's US design studios to produce the same type of projects. With this success Travel Tripper soon sent a request through to produce web banners for Boston Park Plaza and from then on we have become their first stop for design and production of web banners for all of their 1,000+ hotels from all around the world.